Army General Rick Lynch's life-lessons on the power of faith in action. "General Rick Lynch's new book highlights one of his sources of strength: His personal relationship with God. Throughout the book Rick gives the reader detailed insights (thru personal stories and historical and biblical examples) as to how best to strengthen that so very important relationship. Exactly what our nation needs during these difficult times." "Work Hard, Pray Hard is a wonderful account how God wants all of us to do just that. This book inspires us all to follow faith with works. The bible teaches us all “faith without work is dead”. This book shares stories of just how that works!" "As you work hard to execute your life, there are all these questions, doubts and opinions about any journey you may have with God. Why it matters?, how to start?, why continue?, how I’m doing? . . . Rick Lynch shares his journey through the eyes and mind of a Lieutenant General, a father, a husband, and a friend. As he shares his direct application of unique thought and reason, you will gain valuable guidance and indeed your journey may become a bit quicker, as mine has. He has been through it all!" "The power of putting God first in our lives and then living out our faith walk daily can be challenging. Work Hard, Pray Hard: The Power of Faith in Action, provides a real world framework that will bring you closer to God and will equip you to be the Leader God has called you to be. The book is both instructional and inspiring! It’s a must read." "Rick has an uncanny storytelling ability that allows the reader to relate to him on a personal level and grasp the essence of what is truly important in life. His experience and wisdom come through in his words. This powerful and insightful collection of questions and lessons will guide the reader to improved professional and personal success!" "Work Hard, Pray Hard is a glimpse into Gen. Lynch’s journey from passive believer, to active believer, to strong proponent of Christianity. Rick's brutally honest discussion of his personal trial and tribulations is one that every reader can connect with and fill in with their own experiences. A moving and touching book that should cause all to stop, think and reevaluate their own relationship with God." "With simplicity, grace and candor, Rick Lynch's Work Hard, Pray Hard is a powerful guide—through faith in God—for living with purpose and meaning. By combining lessons learned from a career in the military and beyond with Biblical truths, the retired 3 Star General offers both compelling encouragement and motivation for us all." "Rick Lynch's new book may save your life! Stress can be the kiss of death . . . Christian faith heals. Each chapter is grounded in scripture, points you in the right direction, and comes alive with the personal witness of this American centurion." "Through the faith journey of a decorated combat soldier, inspired by the spirit of Captain James Marsh, Work Hard, Pray Hard is a roadmap for each of us, and our nation, in our journey toward humility, inner peace, and faith." "Work Hard, Pray Hard is the account of this man’s life since putting God in control. It’s not just stories of how Gen. Lynch lived as he served our country in military service. It is the way he lives his life. This is the story of the man, illustrated with fast moving, high action, thrillers paralleled by stories from the Holy Bible that have inspired and encouraged him. In the hours I have spent with Gen. Lynch the words “God has a plan” or “God is with us” are part of his daily vocabulary, not just words for this book. He hasn’t just written a book; he has lived this book. You will be inspired, encouraged, and challenged to a more purposeful life to be lived, not being intimidated by the enemies that attack you, but rather “standing like a Stone Wall” staring them down to victory than giving God all the glory. A must read for all!" "Since first meeting Ricky Lynch, my life has not been the same. Rick has taught me that leading by example means living by example. His simple message about the secret of life - Work Hard, Pray Hard, and his inspiring stories about how to live and lead in a world where faith based leadership is all too lacking, will absolutely change your life as well. I’m confident in saying that Rick Lynch has made Captain James Marsh very proud!" – Doug Harward, President and CEO, Training Industries Inc.
"In this book, Gen. Lynch opens up his faith journey with us. He shares the struggles of life and how his faith has grown as he found the inner peace that God desires for all His children. He shares the faith of previous military leaders as well as how his faith guided him and gave him strength to face dangerous situations. Our journey of faith is not easy and Gen. Lynch is transparent about his journey as an encouragement for each of us." “I humbly come to you, not as a preacher, but a student of faith.” These words launch Rick Lynch’s second offering, Work Hard, Pray Hard. He bears his soul and shares his story in a way that invites the reader to look at their own values and actions. Rick’s personal reflections point to faith in Jesus, service to others and an undying call to see prayer as a foundational element of the abundant life. Lt. Gen. Lynch is a warrior and a man who is not afraid to admit his mistakes, limitations and his belief that it is God who brings the victory. Buy the book and enjoy the journey." "This testimonial gets 5 stars for candor, and it reads very well. It is unique, in my experience, in connecting a Soldier at war and in peace with his God. Tie-ins to scripture with specific times and events in Rick Lynch's life are illuminating. This book is NOT about judging others or their faith. It took courage AND faith to write." "A thrilling account of a powerful spiritual journey. As Rick Lynch recounts in humble transparency his spiritual discoveries and growth, I was drawn into each event and moment of insight as if it was my own. Work Hard, Pray Hard is a contemplative view of a child of God finding their place and purpose in creation and in the eyes of God. A must read." "Gen. Lynch is a proven leader with a stellar record both on and off the battlefield. 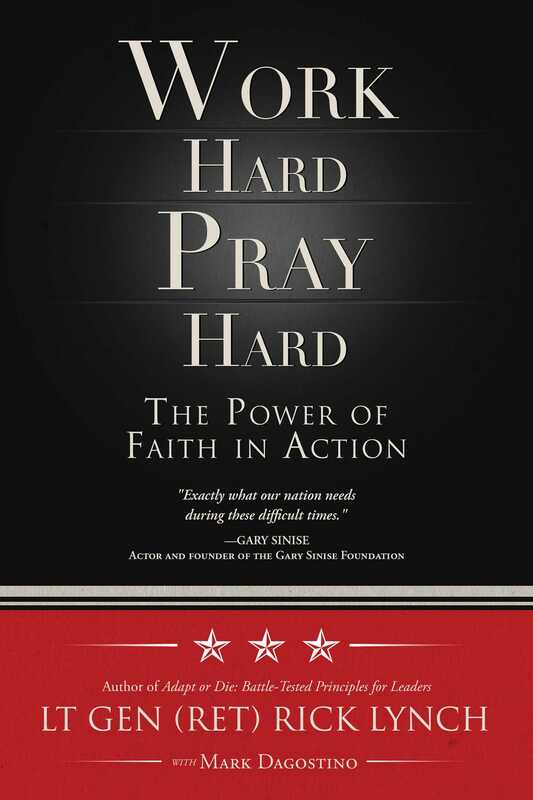 In Work Hard, Pray Hard, he explores the power of faith in action, inspiring readers with a message that stands the test of time." “The sincere and inspiring counsel and wisdom throughout Work Hard, Pray Hard: The Power of Faith in Action provides a timeless foundation of insight what it means to be not just a true leader, but a Godly leader. I have already found myself returning to portions of the book as a resource in my own vocation, but also as I visit with others. Perhaps one of the most salient quotes that sums up Gen. Lynch’s masterful book is, “With God’s help, I was quickly able to overcome my limitations and become the leader I needed to be . . .,"
Like a breath of fresh air, Rick Lynch opens up his life with great humility and honesty. Taking his readers on his personal journey that includes desperately dark days and wonderful silver linings, Gen. Lynch reminds us that we are all leaders – and we are at our best when we allow that leadership to be empowered by the one who created us, redeemed us, saved us and empowers us to be the soldiers of God we are called to be." "Rick and Sarah have lived much of their lives in and around the crucible of war, experiencing tragedy, heartbreak and injustice that would shatter the faith of the strongest. Instead, their faith grew stronger. In Work Hard, Pray Hard we witness their faith in action and learn life-transforming lessons that equip us to fight the good fight, grow our personal faith and finish the race." "We need Christian young people who will rise to leadership. Lt. Gen. Rick Lynch’s book doesn’t just tell young people to be bold—it shows them how to do it. Work Hard, Pray Hard is full of real life experiences that show that hard work and fervent prayer are important and are the keys to success. It is also a heart-rending book, showing us the fragility of life and our need for faith. Lt. Gen. Lynch is right on track that with hard work and a strong relationship with God, we can effect change not only in our lives, but also turn our entire Nation around." The valor of the brave. In that I have lived and served with Lt. Gen. Rick Lynch during the lion's share of the past 30 years, I can both attest that he has lived his creed, and that he has carried the "blood stained banner" to lift, so that God may draw. Work Hard, Pray Hard is a brilliant yield by a phenomenal leader, trainer, mentor, and ambassador for Christ." – Maj. Gen (Ret) Barrye L. Price Ph.D.
"Work Hard, Pray Hard is a great soldier's story of a stirring faith journey. It's also an illuminating account of how to make faith a living thing with direct application to the trials and opportunities of daily life. "In Work Hard, Pray Hard, LTG (R) Lynch speaks from the heart, delivering insightful and inspiring guidance. His pursuit of spiritual fitness is laser-focused, and he is a walking example of using faith to persevere through life's unthinkable challenges. At TAPS, we are so grateful for this steadfast support of our efforts to help the families of America's fallen heroes find hope and healing." "Rick Lynch is an accomplished military leader. He is also a man of great faith. In his first book Adapt or Die, he talked about the role of faith in his own leadership experience. In Work Hard, Pray Hard he opines that we are all leaders and expands on the opportunities we all enjoy should we care to take advantage. An essential read for anyone of faith, or anyone looking for some." "'The Power of Faith in Action' is not just a tagline for this thoughtful spiritual journey. What has touched me personally are the examples of struggle and light. St. John of the Cross wrote about the 'dark night of the soul' and the saving grace of prayer to strengthen, endure and grow. What is remarkable about Work Hard, Pray Hard is the intimacy as well as the universality of what is revealed through both the battlefields of combat and life. As a meditation and a song of gratitude, this book shares lessons from dark nights and the power of Divine love." "An enfrossing and enlightening memoir, Work Hard, Pray Hard is the very personal account of Lt Gen (ret) Rick Lynch's spiritual journey. Set against the narrative of his remarkable military career, the author introduces himself as a 'student of faith' but by the end proves himself a worthy instructor. Highly recommended!" "Inner peace—if you are looking for the peace that transcends all understanding, start by reading this book. The path is outlines and all it will take is your time and dedication to action. General Lynch tells his story in such an open, honest and interesting way that you feel like you know him and you realize you can find that inner peace—he helps you see it is attainable!" "Reading Rick's books leaves one with a blueprint for living your life, not only purposefully, but with passion and, very importanly, compassion, that comes from abiding Faith. I believe that the driving force of his Faith allows him to choose and accomplish great goals, all the whil leading with relentless passion, tempered with genuine kindness from within." "My friend Rick Lynch captures the essence of spiritual fitness. Most people understand physical, mental and emotional fitness, but Rick bring spiritual fitness to the forefront. A powerful message and a pathway to successful leadership."